Used Cookie's June 2008 Challenge Sketch 1. BG Archaic p/p, elements & alphabet, flourish, Brilliance Platinum Planet Ink. The distresses look on the paper looks great and I always love journaling strips! Love the flourish and the star. Great PP's and the flourish adds that special touch. I do like the flourish. The splashes of paint to the cardstock and the little cluster of embellishments enhance the photos nicely. Well done, Marj. I think that is Core Cardstock and Marj has sandpapered it. She did it on Friday night at my place, that is how I know. 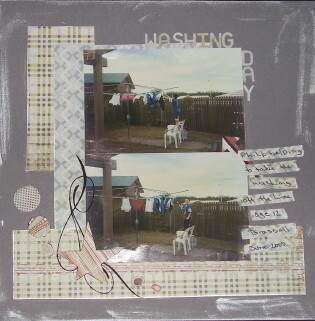 Lovely layout Marj, the flourish and pp go great together, well done. Looking fantastic, Marj! I love it.